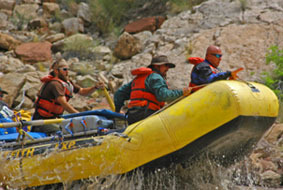 Cataract Canyon...Now with NEW RAPIDS! September’s record breaking rains and the shrinking of Lake Powell have combined to form some new rapids in Cataract Canyon. For about 10 years, Lake Powell has been at record lows. These low lake levels have allowed the Mighty Colorado River to reclaim some of its former rapids. This has given us the chance to run 5 “new” rapids including the very fun and almost mile long rapid of Water Hole. Our Operations Manager, Brenda, was able to squeeze in a trip last week before the government shut down. She reported lots of new debris flows from the recent rains.